"Studying abroad is also a great, rewarding experience…Vacationing is a lot different than living in the country…when you're actually living there, especially with a host family, forced to speak a foreign language, just the idea of everything being so unfamiliar is great. It's amazing not only for yourself, but also for the country and its people. You become a more well-rounded person." 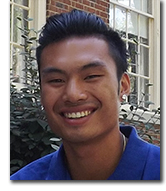 "There were a lot of things I considered when deciding which college I wanted to attend. The main reason I chose Miami is because of its reputation, especially with academics. I knew that Miami would best prepare me for the road to medical school. Even though I always thought of myself as a city kind of person, Oxford is a nice change of pace. "I also love Miami's class size. Ohio State was one of the other schools I was considering when applying, but it is so big. I have spoken with some of my friends that go there, and they told me stories of some classes having 700 people in them! Having smaller class sizes here at Miami allows for better group discussions, and the teachers can get to know you on a more personal level. "My first year at Miami was a shock for me, because I hadn't really been on my own before. There was a lot of adjusting because I've had more free time. In high school, I had to go to classes from 8 to 3, and then I had practice afterward. I would do my homework and then go to sleep. But in college, you have a couple classes a day, and then you have all this free time, which you have to use wisely. My first year was spent learning more about myself and seeing how well I can manage stress and time. It was a good learning experience." "Since I was little, biochemistry and becoming is doctor have both been my thing. I did an internship at Cincinnati Children's Hospital last year and worked in the emergency department. That experience affected me a lot. I want to be a pediatric emergency doctor, and while that will probably change as things go along, I know I want to work with kids. That is definite! "Dr. Cameron Hay-Rollins is one of the most influential professors I've had here at Miami. I took her medical anthropology course, which has been my favorite class so far, because it helped me think of medicine in a different way. Normally, I thought being a doctor was about learning the sciences, learning about the body and what it does, and that's it. But in medical anthropology, I also learned that there are social aspects to medicine. We talked about how factors such as race and socioeconomic position can lead to stress which can affect a person's health. It was an eye-opening experience, in that it allowed me to think more broadly about medicine. Now I am more interested in learning more about medicine from that social side. Dr. Hay-Rollins has always challenged me to think critically. She has high expectations, but that has brought out my best work, because I constantly want to do exceed those expectations. "My most memorable experience at Miami occurred during 2014 Winter Term, in which I studied abroad in Nicaragua as part of the Spanish 203 medical terminology course [Spanish for Health Care Professions]. I have always been driven by international work. My mom is from the Philippines, and my dad is from Malaysia, and when I was growing up, I had the opportunity to go back to those countries to see how hard life is there for many people. That is how I got into the whole pre-med path. In the future, I want to go back to some of those lower-middle-income countries and give back. I have always wanted to make a difference in the lives of these people, especially those who don't have access to healthcare. 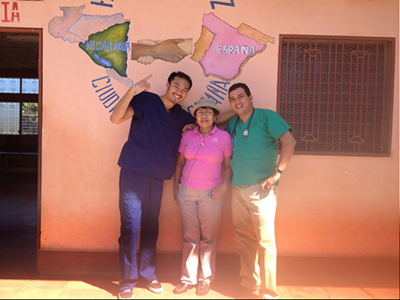 Being able to go on that medical immersion trip gave me a glimpse of exactly what I want to do in the future." "The liberal arts is all about exposure. My dad went to school in England for a couple years, and he would always tell me about the education system over there. Once you make a decision on a path, you only take classes dealing with those paths. Therefore, once you get in it, if you change your mind, then you're really out of luck. I think liberal arts education is great because you get that exposure to lots of different disciplines. "For me, I knew what I wanted to do biochemistry as soon as I came to Miami. Even with that, I was able to get exposed to other things that could help add to my interests. Having a liberal arts education gives people the opportunity to learn different skills that they might have never thought of before. "I have tailored my curriculum to develop skills that I will need for the work I want to do in the future. Biochemistry helps to build the strong science foundation required for medical school; however, I was able to expand my knowledge and skill set due to Miami's liberal arts education. Without it, I would have never found my love for Spanish and global health. They are just really cool subjects for me to learn. I also think they help create a cohesive story, for I believe that my major and minors show evidence of my passion to work internationally." 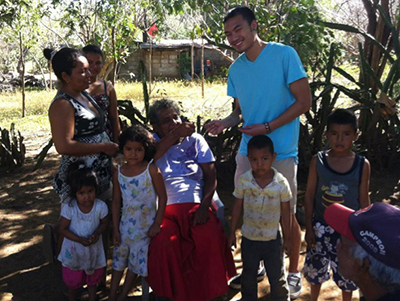 "My trip to Nicaragua was really cool and one of my most humbling experiences. It was arranged by Julie Szucs in the Spanish and Portuguese department and Nohelia Rojas Miesse in the Latin American Studies program. Our group worked in a series of medical brigades over the course of one week. During these brigades, we would set up a pharmacy table for filling prescriptions for the patients, shadow physicians, triage patients, and much more. Since I love to work with kids, I had the pleasure of teaching the kids how to brush their teeth and the importance of hygiene and things like that. Mark Loh shares some time with a Nicaraguan family. "It was also important for me to use my Spanish skills, so that was also great. I have been taking Spanish classes for a while, but never had to apply it, so being able to speak Spanish, especially with my host family, was really cool. I always want to do my best to perfect my Spanish, because once I go back to Spanish-speaking countries in the future I have to be proficient. After the trip, I told myself that I would love to return to Nicaragua to do research with the doctor we worked with there. 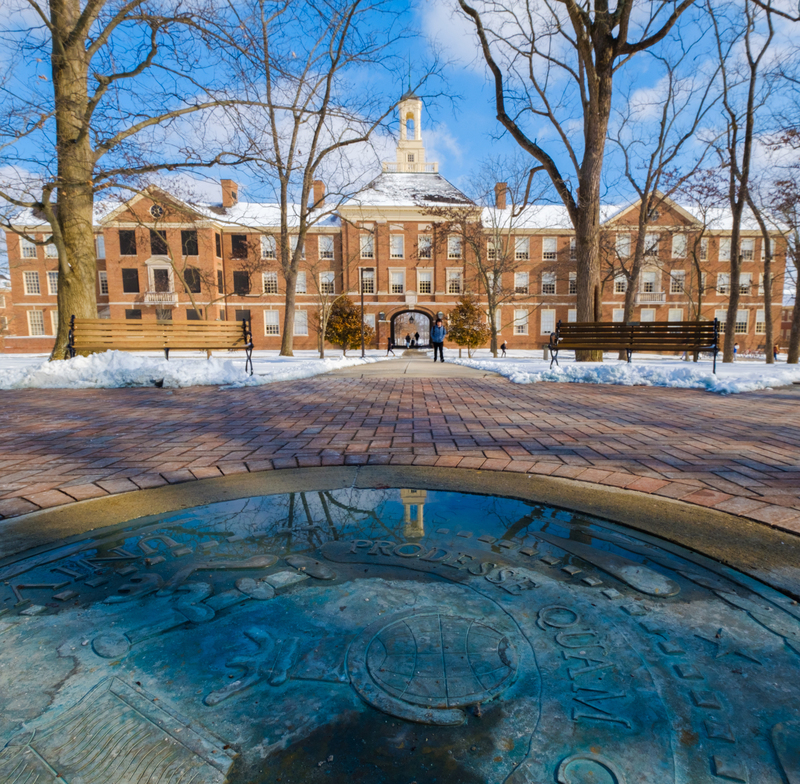 "In fact, that dream came true just this past January during Winter Term 2015. I conducted an independent research study on water quality under the supervision of Professors Julie Szucs, Nohelia Rojas-Miesse, and Jonathan Levy. When I had been in Nicaragua the previous year, I noticed that parasitic diseases were very prevalent in the area. Therefore, I wanted to test the water for E.coli and total coliform (bacteria) to see if the water fostered an environment for parasitic growth. I spent 3 weeks conducting this research while continuing my volunteer work at the free health clinic and the medical brigades. "All in all, I'm truly blessed to have had the opportunity to go to Nicaragua twice. The most rewarding aspects of my experience there was establishing good relationships and concluding my independent research study. I was able to communicate pretty well with one of the physicians with whom we worked. My Spanish and his English just seemed to bounce off each other, but he approached me at the end of the first trip, gave me his email, and said he wanted to stay in contact. I really hope to continue to do so, because I really admire what he does. He doesn't work for much and lives really simply. He provides his free clinics because he truly cares about his people and his country. To me, that is what being a doctor is all about. Everything he said resonated with me, and it’s exactly what I want to do in the future!" "Get yourself to take different classes. A lot of people are set on taking their core requirements for their classes, but sometimes there's an extra class that you take in a different discipline that can be really advantageous—even a class which you think you'll never use. "Studying abroad is also a great, rewarding experience. I know a lot of people don't get the opportunity to live outside the country, or to even go out of the country for vacation. And that is what I think is so special about this opportunity. Vacationing is a lot different than living in the country. When you go on vacation you focus on the hotspots and tourist attractions. But when you're actually living there, especially with a host family, forced to speak a foreign language, just the idea of everything being so unfamiliar is great. It's amazing not only for yourself, but also for the country and its people. You become a more well-rounded person."